The following answers a few question in order to illustrate Post 15 and to develop certain points. Q1: Can a commodity be a monetary instrument? Or, does money grow on trees? Let us tackle the idea that “gold is money”. Clearly, a gold ingot is not a monetary instrument. There is no issuer, no denomination, no term to maturity or any other financial characteristics. A gold ingot is just a commodity, a real asset not a financial asset. Gold coins have been monetary instruments and are still issued at times (Figure 1). There are salt springs, from which they manufacture salt by boiling it in small pans. When the water is boiled for an hour, it becomes a kind of paste, which is formed into cakes of the value of two pence each. […] On this latter species of money the stamp of the grand khan is impressed, and it cannot be prepared by any other than his own officers. Eighty of the cakes are made to pass for a saggio of gold. But when these cakes are carried by traders amongst the inhabitants of the mountains, and other parts little frequented, they obtain a saggio of gold for sixty, fifty, or even forty of the salt cakes, in proportion as they find the natives less civilized. What was the term to maturity? Were the cakes accepted in payment of dues at any time by the emperor? What were the means for the emperor to make the previous financial characteristics a reality? I.e., what were the reflux mechanics? Did the emperor levy dues that could be paid with salt cakes at par? Did the cakes provide conversion into something? Etc. Bearers need to be convinced so trust about the issuer must be established. The bit about the amount of gold that salt cakes could buy is irrelevant. Polo is just telling us that a commodity (gold bullions) was cheaper in the mountains. He might as well have told us about how different the price of apples and potatoes are in different parts of the country. The broad point is that monetary instruments can be made of a commodity but that commodity itself is not a monetary instrument. We all know the expression “money does not grow on trees.” Monetary instruments are not a natural occurrence and for a commodity to become a monetary instruments some specific financial characteristics must be added: a unit of account, a face value, a term to maturity, among others. All this requires an issuer who promises to implement these financial characteristics. To implement that face value by promising to take back at any time the gold nuggets in payments at the stated face value. Now the third condition introduces a problem because it means that the goldminer must be willing to be paid in gold nuggets for his gold nuggets. A dubious business strategy. Q2: Can a monetary instrument be a commodity? Yes. Numismatists are specialists at treating current and former physical monetary instruments as commodities by determining the price of banknotes and coins in terms of their rarity, peculiarity, etc. 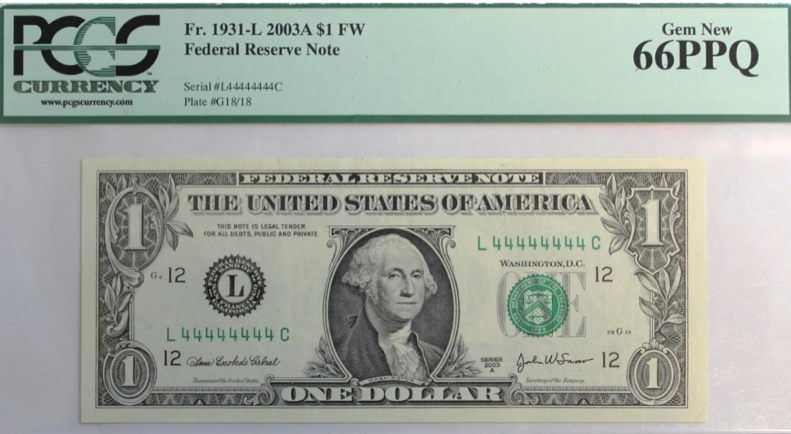 For example the $1 FRN in Figure 2 is worth $1200 currently because of its peculiar serial number. But that is not its fair value as a monetary instrument. If one buys this note and goes to a store or to a government office, the person to whom one hands the note will only take it for $1. The same applies to the buffalo gold coin above. One can use it to pay debts owed to the government but only $50 worth, not more nor less, even though the coin is worth thousands of dollars as a collectible item. One can redeem them at the Treasury (to pay debts owed to the Treasury or to get Federal Reserve notes) or deposit them at banks, but only at face value. That is their value as monetary instrument. Their value as a collectible item is sometimes much higher. Finally, a fun example is the current case of the penny, which brings us back to darker times of monetary history (see Post 17). A while back, National Public Radio ran a segment on penny hoarders. These are people whose hobby is to hoard pre-1982 pennies. Some even go to their local banks and spend their evenings triaging boxes of pennies. Why would they do that would you ask? Pre-1982 pennies are made mostly of copper and, given that the price of a pound of copper tripled over the past ten years, the face value of a penny is half the intrinsic value (i.e. value of the content of copper): face value is 1 cent, intrinsic value is 2 cents, 100% profit from selling pennies for their copper content! Currently, there is one small problem with this portfolio strategy: It is illegal to destroy government currency. However, the government is considering the possibility of demonetizing the penny coin because it costs more to make than its face value, and because US residents mostly find it cumbersome to use. If the government ever demonetizes the penny coin, penny hoarders are ready to rush to their local scrap metal dealers. Q3: Is money what money does? Francis Amasa Walker concluded in the late 19th century that “money is what money does.” This has been an extremely influential way of analyzing monetary systems in many different disciplines: economics, anthropology, law, among others. It is used in a narrow way by economists who use the Real Exchange Economy framework and who focus on the function of medium of exchange. In order to avoid the problem of double coincidence of wants induced by barter (Joe has apples and wants pears, Jane has pears but wants peaches), a unique commodity was progressively sorted out as best for market exchanges. Thus, a monetary system can be detected by checking for the presence of a medium of exchange. Anthropologists, among others, reject this narrow functional approach. In primitive societies, exchange was not done principally, or even at all, for economic reasons and so the nonexistence of a double coincidence of wants was not a problem. The broad functional approach classifies anything as monetary instrument as long as it performs all or parts of the functions attributed to monetary instruments. The distinction between “all-purpose money” and “special-purpose money” follows. Inquirer may pick and choose depending on the circumstances, which may lead the inquirer to impose inappropriately his own experience to explain the inner workings of completely different societies. Inquirer may tend to assume that monetary instruments must take a physical form when they may be immaterial. Inquirer may exclude things that are monetary instruments but are not used for any of the functions. Collectible coins and notes are monetary instruments as long as the issuer does not demonetize them. More broadly, too much emphasis will be put on detecting things that fulfill the selected function and not enough effort will be devoted to a detailed account of the unit of account used, how the fair value was determined and if it fluctuated, how the reflux mechanisms were implemented, etc. The example of the salt cakes above is an illustration of that point. Just noting that something is used as medium of exchange or means of payment, and moving on to something else, is a poor means to perform monetary analysis. This approach also creates difficulties to convincingly include “money” in models, and pushes to ignore the financial side of the economy and the role of nominal aspects. Monetary instruments are mere commodities and do grow on trees—there are fruits—and all debt payments are denominated in fruit. However, from this description, one cannot conclude that cowries were monetary instruments used by the king to finance the purchase of foreign goods and services. Indeed, it is not explained what the unit of account of the Maldives was and how cowries were monetized, i.e., who, if anybody, issued them as financial instruments (did the royal authority issue them and was the royal bank ready to accept cowries in payments? ), and what their relationship relative to the unit of account was. In addition, the role of cowries as monetary instruments is doubtful for the Maldives because cowry shells were worth nothing against goods “except by shipload” (Polanyi 1966, 190)—an extremely inconvenient means of payment and medium of exchange. What one can conclude from the description is that the Maldives authorities were involved in the trade of cowries with Indian and Arab merchants. They were exporting cowries against imports of other goods—a situation of bilateral trade, not a situation of cowry monetary system. Q4: Are contemporary government monetary instruments irredeemable? Or, is the fair value of contemporary government monetary instruments zero? Bearers demand conversion into something else at a given rate: government currency for bank accounts, foreign currency for government currency, etc. Bearers pay the issuer: governments take their currency in payments of dues owed to them, as do banks. The payment allows bearers to avoid jail time and other legal problems. So to be redeemable a monetary instrument does NOT have to be convertible. As such the fair value of a monetary instruments, its net present value, is face value. Given that no coupon was paid, then P = 0. But this does not apply today because monetary instruments are redeemable on demand by bearers at a very stable face value. Remember that balance sheets are interrelated so if a financial liability is worth zero in one balance sheet, then a financial asset must be worth zero in another balance sheet. Turner makes an accounting error. Why would the private sector be willing to hold something that is worth zero? There is no benefit that comes from accepting a monetary instrument, not even avoiding prison because taxes cannot be paid with government monetary instruments. If valued at zero then balance sheets should record a large loss of assets (and net worth) for banks, firms, and households: Your monetary balances are worth nothing in nominal terms! Q5: Is monetary logic circular? No. The acceptance of a monetary instrument by anybody ultimately rests in the confidence in the issuer, not in the confidence that other potential bearers will accept. Q6: Do issuers of monetary instruments promise a stable purchasing power? No. If that was the case, issuers of monetary instrument would have defaulted on their promise continuously since the beginning of financial times. They never were able to provide a stable purchasing power, even less so since the end of World War Two. As such the demand for monetary instruments would be nil if a stable purchasing power was a promise embedded in monetary instrument because the creditworthiness of the issuer would be nil. A stable purchasing power is not a promise of any issuer of monetary instruments. This is fine for most bearers as long as the purchasing power of monetary instruments is relatively stable in the short-term. If one wants something that holds purchasing power over the medium to long run, then one should switch to other assets. Q7: Are monetary instruments necessarily financial in nature? Yes, remember: “money does not grow on trees.” While monetary instruments can be made of a commodity that commodity does not tell us anything about the monetary nature of a thing. A gold coin is a monetary instrument not because it is made of gold but because of its financial characteristics. Gold is a collateral embedded in the coin. Similarly a house is not a mortgage, a house is a collateral for a mortgage and nothing can be learned about the inner workings of mortgages by studying how a house is made. The “primitive moneys” would need to be studied much more carefully to determine if some of them were monetary instruments. Just checking if they passed hands in exchange of goods and services, if they were used to pay for a bride, etc. is a poor means of determining the “moneyness” of something given that one cannot make a difference between in-kind payments and monetary payments. We saw above that cowry shells were not monetary instruments in the Maldives but they were in Africa and detailed analysis has been done to establish that fact. Q7: Are credit cards monetary instruments? What about pizza coupons? What about pretend-play banknotes and coins? What about bitcoins? A credit card is not a financial instrument—it does not have a maturity (issuers of credit cards do not accept credit cards in payment) and it is not related to a unit of account (it is not a carrier of the unit of account). The underlying credit line is not financial instrument either. The line represents the maximum amount of a customer’s promissory note (called credit card receivables) that a credit company is willing to take on its balance sheet. Say that household #1 wants to get a credit card from Bank A. #1 fills up the required documentation so A can check #1’s creditworthiness. #1 is approved by A and gets a $1000 credit line. Where is that recorded on the balance sheet? Nowhere, it is an off-balance sheet item. The line is just saying that A will take on its balance sheet up to $1000 of #1’s promissory notes without asking again to check #1’s creditworthiness. Post 10 shows what happens when a credit line is used: A’s assets rise by the amount of line drawn by #1, #1’s liabilities rise by that same amount. What about a pizza coupon? It has an instantaneous maturity (one can go to the pizza shop at any time to claim a pizza), it is a convertible, but it not a financial instrument because it does not involve monetary payments but merely in-kind payments: it converts into a commodity. If the coupon could be used to pay debts owed to the pizza shop at any time, if the pizza shop stated at what value it would take the coupon in payments, then it would be a monetary instrument. 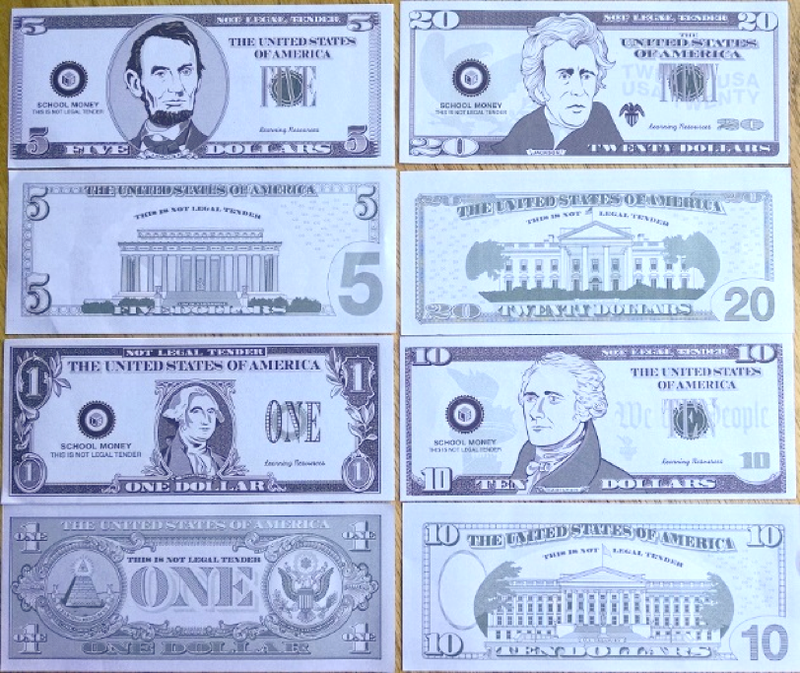 Change the design: too close to the design of Federal Reserve notes even though it is a crude imitation. “The United States of America” should be eliminated because they are not issued by the government. Promise to take the notes in payments: Bearers can pay the company with the notes to buy things from, and clear debts owed to, the company. Finally, bitcoins do not have any issuer and are irredeemable. The first problem prevent them to be a monetary instrument, the second problem makes them valueless as monetary instruments. Bitcoins are commodities/real assets, not financial assets. Q8: What were some errors made in past monetary systems? Given the characteristics of monetary instruments, they should circulate at parity all the time; however, actual circulation at par does not define a monetary instrument. Par circulation is only the result of the inner characteristics of a financial instrument, together with the existence of a proper financial infrastructure that allows these characteristics to be expressed in the fair value. Only recently has there been well-functioning monetary systems. They are not without problems but in general they ensure a smooth processing of payments and can be used as a reliable medium of exchange, both of which help to promote economic prosperity to some extent. No stamped face value: In the Middle Ages, King cried up or down (i.e. changed by decree) the face value too many times. What is the problem? Nobody had any idea what face value was: “there were so many edicts in force referring to changes in the [face] value of the coins, that none but an expert could tell what the [face] value of various coins of different issues were, and they became highly speculative commodities” (Innes 1913, 386). What is the problem? Kings legalized counterfeiting. Anybody with gold could issue a debt of the king, i.e. make the king liable. Today, in the United States, an equivalent would be for the Bureau of Engraving and Printing to print Federal Reserve notes for anybody who comes with paper that respects the Bureau’s specifications. What is the problem? Fair price is zero unless there is a collateral or a recourse. There is a redeeming clause but no actual means to implement it because no payment is due to the issuer (e.g., Post 17 shows that taxes during the time of colonial bills were not always implemented when they were supposed to be), or conversion is very difficult (banks during wildcat era). What is the problem? The term to maturity is no longer instantaneous as promised but depends on the expectations of bearers. As such the discount factor comes back into the valuation of the fair price and so the fair price is unstable and varies with confidence of bearers about the issuer. Lack of a proper interbank payment system: in that case interbank debts are difficult to clear and settle. This creates all sorts of problems going from delays in processing payments, to loss of purchasing power because some bank monetary instruments trade at a discount relative to other bank monetary instruments, to full blown financial crises because payments cannot be processed and so creditors do not receive what they are owed and in turn cannot pay their own creditors. Q9: Do legal tender laws define monetary instruments? What about fixed price? Legal tender laws state that, in court settlements, creditors must accept whatever is defined as legal tender in payments of what is owed to them. If they do not accept, they cannot sue their debtors for unpaid dues. This does not mean that a legal tender cannot be refused during petty transactions. The current legal tenders in the United States are Federal Reserve notes, but plenty of shops and government offices refuse cash payments. Something that is legal tender is not necessarily a monetary instrument. In the past, commodities have been included in the legal tender laws; thereby, compelling creditors to accept payments in kind. Post 17 develops the case of tobacco leafs in the United States, which came about because of a shortage of monetary instruments. Something that has a fixed price is also not necessarily a monetary instrument. It may just be a commodity managed by an economic unit. Q10: Is it up to people to decide what a monetary instrument is? Who decides when something is demonetized? The public opinion about what is or what is not a monetary instrument does not matter and popular belief by itself cannot turn something into a monetary instrument. To take an analogy, one can use a shoe to hammer nails but it does not make the shoe a hammer. The fact that everybody thinks that shoes are hammers does not turn shoes into hammers. If everybody is delusional enough to believe the contrary, there will be many more work-related accidents and productivity will drop because shoes are not built properly to hammer nails. In a similar fashion if everybody wants to believe that gold nuggets, tobacco leafs, or grains of salt are monetary instruments, the payment system will not work smoothly and economic activity will suffer. As explained in Q2, some monetary instruments are used merely as collectible items. Some persons may also use monetary instruments as ornaments and for other non-economic uses. These other uses do not demonetize a monetary instrument. That can only happen if a monetary instrument seizes to be a promise and that is up to the issuer to decide. Q11: Can anybody create a monetary instrument? Yes as long as one does not counterfeit existing monetary instruments, one can do so. Good luck getting it accepted. Done for today! Next is the final post of the series: Monetary history. You are welcome. I am about to fully edit everything to account for the very useful comments I received (like calgacus’s) and typos. Creditors cannot refuse payments with something that is legal tender. That is not correct. Of course they can refuse, and the debt remains. What creditors can’t do is dun or sue the debtor for payment, once they have refused legal tender payment. OK sure. Went a bit too fast here. Thanks! The only authority which can withdraw or inject/lend central bank reserves is the central bank, right? So banks cannot by themselves remove reserves form circulation without making purchases (for instance treasuries) with the FED. Let’s now get to 2008 crisis(just a random example of bank crisis), banks failed because of CDOs and stuff, but reserves were still there, I guess. Why did the government had to bail banks out? I mean, the central bank could just cover the likely lack of reserves due to the unbridled lending in order to save the “credit part” of the bank and let the “financial part” fail as other financial institutions will have done. I did not understand why if for instance a bank fails because of its reckless trading for instance, even the credit giving sector is hit. Many thanks to whoever can answer this, it has been a long time I’ve been posing this question. I am economics student by the way. Thanks! Just one thing, what are the “parts” you are referring to? This is a series (you are reading part 16). Private sector itself has a tax liability, not written to its balance sheet that acts as a counterpart to the monetary base it has as an asset. For something to be described as an “liability” it has to be some kind of burden, am I right? But government by its very nature is law setter, not law follower. For example here it has set the law and the liability to private sector to pay taxes. So who carries the liability? Is there any sense to extend the accounting methods that were developed for the private sector entities in the first place to the government? These accounting methods were developed to count assets and liabilities of those who have to follow the law. Of course they are off balance sheet because actual amount of tax liability private sector has is infinite because time is infinite. How do you mark up infinite liability on a balance-sheet? But I would like you to answer this simple question using clear logic not tautologies: how is monetary base _liability_ of the government, given that government is the law maker? Nature of the use of power is simple. Take for example a King, absolute monarch. He makes the laws, others obey. If he makes a law that obligates himself to something, he can change the law so that it doesn’t. So it is absolutely one sided relationship between King and his subjects. And that one-sidedness is at the heart of use of power. So the government as the law setter imposes obligations to others. Tax liabilities are good example. But the government itself is above liabilities. Like monarch, it can make a new law unobligating it from any previous commitments it has made. It seems to me that obsession with balance-sheets prevents MMT economist from seeing who really has liabilities in the economy and who does not. 2- corporate bonds are repaid in monetary instrument. Now indeed the government can change the law or can change the promise but then they are consequences for the government also because they monetary system may become dysfunctional. Kings that cried up and down coinage to often created confusion, promote frauds, etc. The main point here is that once gov (or other issuer) make a promise they better keep it otherwise bearers will start losing trust and the monetary system won’t work as smoothly. Note that I have not used balance sheets or accounting here. I am working from the point of view of the mechanics of finance. Well I just don’t think word “liability” is appropriate because that implies object is some kind of burden to the government. We know powers of the sovereign government. It can make any payment in its own currency, it can own it all by legislating it so, et cetera. It is easy to see why money users liabilities are really liabilities. They have to deliver outside asset they do not issue. That’s a burden. In a former example burden is carried by the private sector in a form of tax liability. Even after reading your great blog posts and Wray’s equally great book I still can’t figure out why there would be interbank loans left after so many rounds of QE (especially in Europe). It’s hard to image that banks are still exposed to one another by lending of abundant reserves that actually cost money to hold nowadays; about every bank should have enough reserves as on a system level their accounts are basically flooded through QE/OMO’s while lending has pretty much stalled. Any thoughts on that? Because some banks still need to access the interbank market because they lack reserves.QE purchased a lot of Treasuries and MBS. Wall Street banks have plenty of that. You mean those that are not primary dealers need to get it from the ones that are? It’s just that since there are three times more excess reserves than there are minimum reserves (https://www.ecb.europa.eu/mopo/implement/mr/html/index.en.html) you would expect these to have yet been distributed in such a way that every bank (especially large ones) has more than enough reserves already without much interbank lending. Whereas there were bonds or MBS’s on the balance sheet, there are now reserves (instead of bonds/MBS’s + borrowed reserves from other banks). Would you agree? Well all I can say is that data shows that some banks seems to still need enter the interbank market. 1) No government-provided deposit insurance. 2) No fiat lender of last resort. 5) No inherent boom-bust cycle. But why share when government subsidies for private credit creation allow those with equity to legally steal the purchasing power of the less so-called creditworthy? Government subsidies for private credit creation are indefensible from both a moral and endogenous money creation standpoint. It’s time to move on, no? Not that we even necessarily need endogenous money creation to any large extent since equal distributions of new fiat (exogenous money) to all citizens* should be able to drive interest rates in fiat to near zero, if desired, and without cheating anyone. So then, what are the excuses for our present system of government-subsidized private credit creation again? A system that benefits the banks and the rich, the most so-called creditworthy, at the expense of the poor, the least so-called creditworthy? That the current system works? Based on who’s running for President in the US, it apparently doesn’t. And why should it? Is God successfully mocked? *into inherently risk-free individual citizen accounts at the central bank, of course. I agree with about 95% of MMT but I don’t understand the hostility here to bitcoins. How can they not be a financial instrument? I use them all the time, I have never had any problem transferring them or redeeming them. Financial instruments have a jurisdictional property, and claims enforceability. In what jurisdiction can bitcoin claims be enforced? Bitcoin is not money as it is not a claim. Personally, I’m not hostile to bitcoin, it simply doesn’t have the properties of money. If one wants to use it, it’s at one’s own peril. There is some possible value added in the ideas behind bitcoin payment system (although quite a bit as too be done to make it a viable alternative to what we have). But all this can be grafted to existing current monetary systems. Bitcoins are too problematic to be a reliable monetary instrument (fixed stock, exogenous and arbitrary injection, no possible destruction, no issuer, among others). Bitcoins are sold as an alternative to the greedy banks, which not only unjustly bundles together WS banks and others, but also suggests that they are a real alternative when they are not. Money is a claim on wealth, a claim on production. Gold is not a claim on anything. Commodities are not claims. But gold has a function in settling international trade imbalances, because sovereigns have no use for foreign claims on production. Sovereigns have no use for gold either, but something is needed to settle trade imbalances, to force countries that are spending too much to produce something &/or decrease their foreign demand. Otherwise the country that spends too much and produces too little faces a decline in FX, that will decrease their purchasing ability. Unfortunately, FX values are subject to non-trade manipulation that obviates remedy. So gold actually has a real function. Since a sovereign can create claims at will, they have no need of anyone else’ foreign claims. There is a big difference though. Banks trade in promissory notes not goods. The goldminer will soon get out of business because he is trading in commodities. “Q5: Is monetary logic circular? Considering the history of monetizing economies, coercion rather than confidence would seem to be operative. I believe Prof. Mosler talks about this, in regard of MMT, and money – tax issue. It might be in an earlier article in this series, I haven’t read all. Bearers believe that the issuer will be able to fulfill what is promised and yes force may be the ultimate means to fulfill that promise (check part 15). Really for countries, but not for small towns, where they can have social/alternative currencies, because there is sense of community. There are convertible at par in the national currency though. That’s the bigger carrot. Are there example of unconvertible local currencies? I would like to see how they work if anybody has an example.